At 23, Jessica Crowley had held a lot of good starting jobs for a young adult, but not anything in which she felt she could build a career. 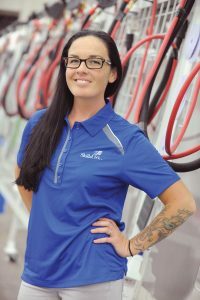 In 2010, she became interested in auto body technology and enrolled in that program at the College of Western Idaho, in Nampa. By 2012, Crowley had earned a bronze medal in the postsecondary Automotive Refinishing Technology (ART) competition at the SkillsUSA Championships. On the spot, she was asked to submit her résumé to PPG Industries Inc.
Crowley was hired as a commercial territory manager. 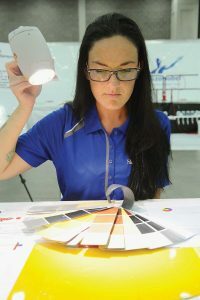 “And the reason I was placed in that role through PPG is because during that yearlong interviewing process, I worked at a manufacturing facility as a lead commercial painter,” she explains. She worked the sales position for three years and is now a technical sales instructor in Concord, Calif.
“There’s a huge skills gap in general, but especially on the commercial, industrial side. The manufacturing facilities are always looking for new blood to come in and to be trained,” she says. Two years after competing at nationals, Crowley returned as a member of SkillsUSA’s Automotive Refinishing Technology technical committee. She now serves as its co-chair. Remembering PPG representatives’ help during her own competition, she made a goal to be on the technical committee in five years. She made it in two. “Every year, we try to look for more students who are achieving more, who are going beyond, who are picking up after themselves and not leaving their areas a mess,” Crowley says. She sees the students who are excited to join SkillsUSA as the same people who become successful in her industry. “Being a SkillsUSA member means that you are willing to give back, work hard and excel in all tasks. SkillsUSA drives home the importance of soft skills, which is a must in today’s customer-driven landscape. A strong work ethic needs to be partnered with detail-orientated craftsmanship, and SkillsUSA teaches this through example.